Refined Pleasures in the Study: Treasures and Curios from Traditional Study, National Museum of History, Taiwan, 2007, pp. 44-5. 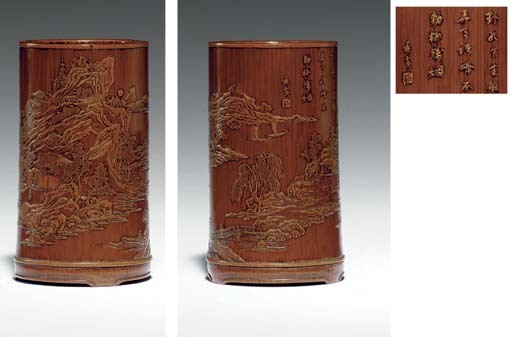 This exceptional brushpot is a testament to the skill and aesthetic taste of the finest early Qing dynasty bamboo carvers, of whom Zhang Xihuang ranks among the highest. He is renowned for his liu qing technique of carving, where the upper layer of the bamboo is carved away, forming the negative, or background, and the skin which remains forms the positive image. The pronounced contrast in color is achieved through a drying process in which the green skin of the bamboo matures to a rich yellowish-brown, and the stalk, or inner portion, a darker, lustrous brown. The scholarly insight into the landscape Zhang has created only strengthens the assumption that the artist must have been a member of the literati class. It is also worth noting that while figures appear in Zhang's landscapes, the artist rarely stresses their details, rather devoting the most attention to the careful and naturalistic rendition of the scenery. For a further discussion of the artist, see Chu-Tsing Li and James C.Y. Watt, The Chinese Scholar's Studio: Artistic Life in the Late Ming Period, New York, 1987, pp. 174-5. See ibid., no. 57, for a wristrest by Zhang Xihuang carved with a similar landscape, and another in the catalogue, The Arts of the Ming Dynasty, London, 1957, pl. 102, no. 383. A bamboo brushpot from the collection of Sir Percival David, dated to the seventeenth century, is illustrated by R. S. Jenyns and W. Watson in Chinese Art III, New York, 1966, p. 265, no. 198, where the authors note that Zhang Xihuang was one of the five most famous bamboo carvers, and the illustrated brushpot "is most delicate and elegant." See, also, a brushpot of square form, illustrated in the Min Chiu Society Thirtieth Anniversary Exhibition, Hong Kong, 1991, no. 244.